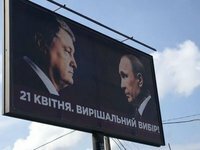 Provocative outdoor advertising in the style of campaigning by incumbent President Petro Poroshenko's headquarters, has been posted in violation of the law, National Police Spokesman Yaroslav Trakalo has said. Police are now checking all regions where the placement of the billboards has appeared. "According to part 2 of Article 222-13 of Code of Ukraine on Administrative Offenses, distribution of outdoor advertising without information specified by legislation is punishable. Persons responsible for the political advertising will be liable," Trakalo said, adding the billboards would be taken down.